Our good friend, Angry Julie is here today to describe one of the latest, greatest social media tools, a website known as Pinterest – an online pinboard. 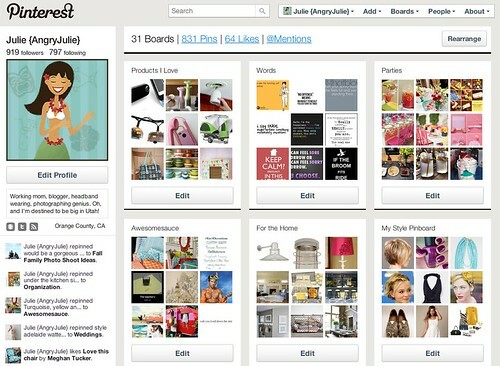 It is a great way to visually catalog (pin) all the things you love online. 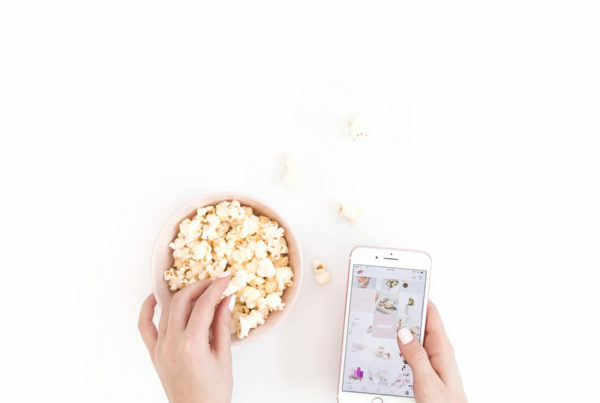 Read on to learn more about Pinterest and how you can snag a personal invite from Julie to create your very own Pinterest board. I’m already bogged down by Social Networking, and a few months ago, another site came onboard. Honestly, at first, I felt like I was cheating on my lover, Twitter. However, Pinterest really channels my online loves and delights. I can go on the site late at night, look at pretty things, and I don’t even have to talk to anyone. Not that I don’t love conversation, but sometimes, I just want to scroll through and look at pretty pictures. What is Pinterest? And why should you join? Pinterest is a virtual pin board, where you categorize things that you love and want to remember by topic. Before discovering Pinterest, I had bookmarks saved on three different computers. I also had old blog posts marked in my Google Reader. You can imagine how much online clutter I accumulate. I save all of these amazing tutorials, recipes, and crafts that I someday, “hope to make, do, and create” amongst my computers. When I heard about Pinterest, I became giddy. Within the first week of using it, I probably spent 2-3 hours online just looking at all the cool stuff, and “pinning it” for myself. I currently have 31 pin boards and 831 pins. Right now, Pinterest is only available “invitation only.” It is technically in Beta version still. 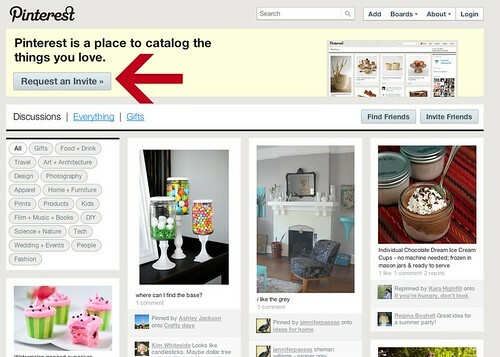 You can request an official invite from Pinterest. And you can also have someone whom is already on Pinterest send you an invite. If you would like an invite, send me an email at angryjuliemonday at gmail.com. When I initially started on Pinterest, I mostly “re-pinned” other people’s pins. You can use the “search” box to look for things such as “food, crafts, bathrooms, photography, and weddings.” You will get thousands of items using general search terms like this. 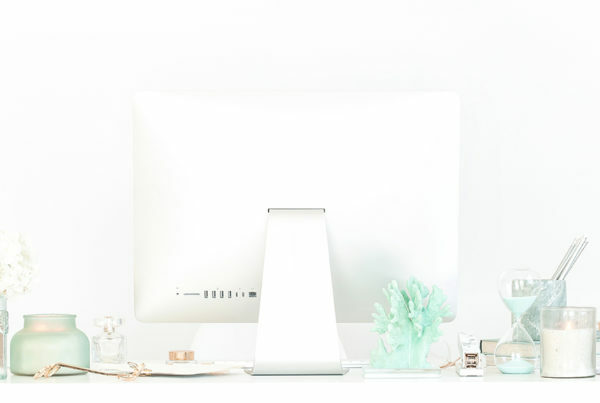 However you can do two things – pin or repin photos. How do you “re-pin” things? In the top left corner of each “pin” or photograph, there is a button marked “Repin.” You click on that button, and it will open up in another window. In the next window, you will have a choice of your boards (aka categories). You can also change the “description” of your pin. Many people make personal comments about their pins. You’ll want to be sure to remember this feature when quickly pinning. You don’t want to re-pin something with the phrase, “He is hubba hubba hot and I might leave my husband, Steve, for him.” That might be a little odd and a bit awkward. Now that I’ve taught you how to “re-pin” something, I will show you how to “pin” an original pin of your own. Find the photograph you want to pin. I chose a sofa that I covet from Pottery Barn (see below). Find the link/url, or the permalink, for the picture and copy it. 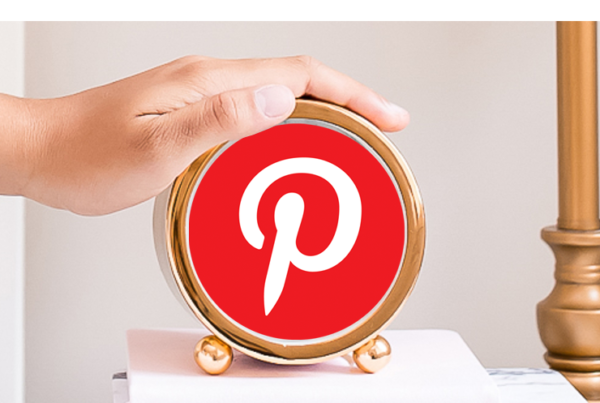 Go to the top right corner of Pinterest and clicked “Add Pin.” A new blank window will open up. Paste the link in the url field. After you do that, the photo will automatically load. Chose a “category” for your pin and describe it. You can also add the “Pinterest Bookmarklet” to your Internet Browser. 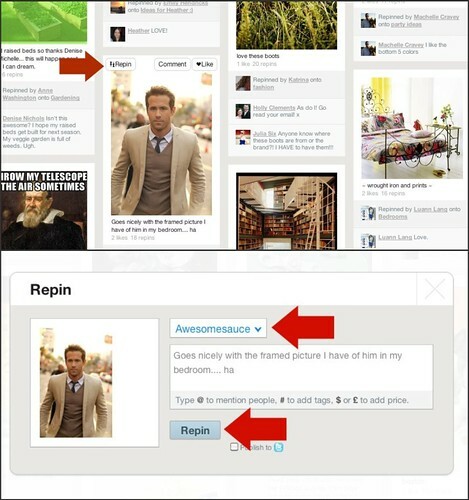 Click on the “Add Pin” button at the top right corner of Pinterest. You will be to drag the bookmarklet to your browser toolbar. 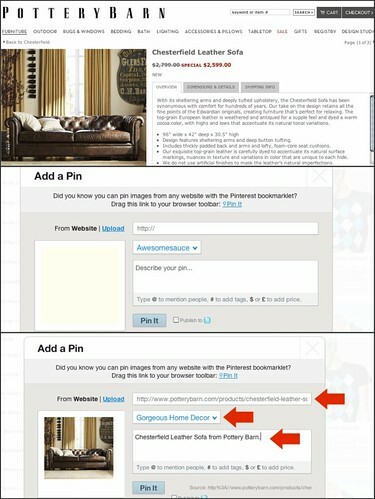 If you are an iPhone, iPad or iTouch user, there is an app for Pinterest. They just had an update and added a ton of features. Julie, also known as Angry Julie, lives in Orange County, CA. She works full-time in the legal sector taking photographs. She is married, and has a 6-year old son. When she isn’t busy taking pictures of her son, she is attempting to be an athlete, or playing with her coveted device, her iPhone. Find more of her photographs and ramblings on her blog at Angry Julie Monday. Previous PostA Blogger From Down Undah: Crikey mUm! have right here on this post. I will probably be coming back to your blog for more soon. This was a wonderful post on Pinterest. I’ve bookmarked for future references. Thanks sooo Much!! I’m new to Pinterest and have a question. How can I “pin” something to my Pinterest site that is from My Pictures folder on my computer? Or can I only “pin” things that are on someone’s website? I am a pintrest junkie already. Thank you for the tips.